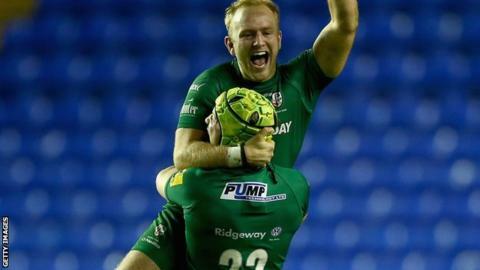 A last-minute drop-goal from Shane Geraghty gave London Irish a dramatic win over Exeter Chiefs. The visitors led 13-5 at the break thanks to a try from Dean Mumm and the boot of Gareth Steenson. Tom Guest and Alex Lewington both went over early in the second half before Blair Cowan, who scored Irish's try in the first half, got his second. A converted Dave Ewers try closed the gap and two Steenson penalties gave Exeter the lead before Geraghty won it. Exeter, who have now lost four successive Premiership matches, were outscored by four tries to two and it was only the immaculate goal kicking of Steenson that kept the Chiefs in contention. They had started more strongly, too, with Henry Slade's early penalty kick bouncing back off a post before Steenson slotted another kick to put them ahead. Minutes later, Geraghty had his first attempt at goal from halfway but fell just short. However Exeter soon conceded another scrummage penalty and this time Irish were rewarded for an attacking line-out when Cowan was driven over. The lead did not last long, though, with Irish committing a scrummage offence of their own and Steenson making no mistake with his kick. The advantage was extended soon after when Irish wing Alex Lewington knocked on in his own 22 and Mumm forced his way over for the try. Steenson converted for a 13-5 interval lead. Slade missed a penalty chance at the beginning of the second half and was punished when Irish scored their second try. Following a pre-planned line-out move, Cowan and David Paice combined to create the score for Guest, with Geraghty converting. Two minutes later, Irish crossed again. Fergus Mulchrone's pass gave Lewington the chance to redeem his early error and he did so by holding off Moray Low, Slade and Ewers to squeeze over for the try. A miserable third quarter for the Chiefs was completed when a neat Geraghty pass sent Cowan in for his second try to leave the visitors trailing 22-13 with 20 minutes remaining. Chiefs responded when Sam Hill's burst put the home defence on the back foot and allowed Ewers to crash over for a try, which Steenson converted. Homer and Steenson exchanged penalties to set up an exciting finish, with the latter's fourth penalty nudging the Chiefs ahead before Geraghty's very late effort gave Irish a morale-boosting win. "Most sides would have played for a penalty and we made the correct decision but very few ball players would want to step up like that and it shows the class of the man. "I thought we had blown our chance, when we gave away those two penalties in quick succession and I knew (Gareth) Steenson wasn't going to miss. "Losing down there was the turning point of our season. They celebrated hard; it didn't go unnoticed and it hurt us, so there was plenty of motivation today." "The next win is proving tough to find. "We are a little bit hesitant and we are expecting things to happen as opposed to making them happen." "Having been on a losing run, we knew it was going to be a bit nervy and despite what I said, it was. We had an opportunity to move up to fourth place but we didn't take it." London Irish: Fenby; Ojo, Mulchrone, Griffin, Lewington; Geraghty, Steele; Court, Paice, Aulika; Skivington (capt), Rouse; Guest, Cowan, Treviranus. Replacements: Allen, Parr, Cross, Leo, K Low, O'Leary, Dorrian, Homer. Exeter: Dollman; Nowell, Slade, Hill, Jess; Steenson, Chudley; Rimmer, Yeandle, Francis; Mumm (capt), Welch; Ewers, Armand, Waldrom. Replacements: Cowan-Dickie, Moon, M Low, Johnson, Simmonds, Thomas, Whitten, McGuigan.